The Paramount Theater is excited to bring Compass Creative Dramatics back this summer for a week-long theater residency from Monday, June 10 through Saturday, June 15! Compass Creative Dramatics (CCD) is a Chicago based touring company that partners with community organizations to offer creative, engaging theater programming designed to provide arts enrichment and cultivate personal growth and character. CCD’s one week residency provides an opportunity for youth to work alongside two professional artists in mounting a full theatrical production on The Paramount’s stage! The residency begins with an audition, followed by a week of rehearsals and theater workshops, and culminates with an original 60-minute musical adaptation of a classic children’s story. CCD provides all the elements of the production – professionally designed and produced music, costumes, props, sets, and make-up – all to make this an unforgettable experience for everyone! The residency is designed to purposefully and intrinsically instill skills of character such as trustworthiness, respect, and responsibility while participants stretch their muscles of creativity and bravery through the art of theater. No acting experience necessary – just come ready to be silly and have fun! Two stage managers are also cast to help with rehearsals and take on important back stage responsibilities. CCD encourages students to take creative risks and trust without self-judgment, stretching their creativity and bravery “muscles” as they develop social skills like teamwork, respect, and empathy through their exploration of theater. Auditions: First day of camp! When the local superhero league announces it’s looking for new members, Cinderella is eager to try out so she can make the world a better place. The only problem is (unlike her lazy stepsisters) she wasn’t born with a superpower! 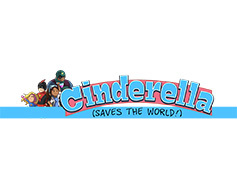 But a group of friendly scientists has a few tricks up their sleeves, and with their assistance (plus the help of some curious kittens and a very mysterious group of elderly folk), Cinderella just might find a way to save the world! We recommend that you REGISTER EARLY, as the Residency has a limited capacity. Week-long Theater Residency culminating in two public performances on The Paramount’s Stage!